Today i had a busy day, but i had more energy then in the past few days. However, i am still not up to the amount of energy i typically have. I am down 9 pounds since March 1st. An interesting thing i have noticed, and mom and lindsay say it is the same with them, is there are no noticeable symptoms of hunger until i am really hungry. Basically, there is no lead up to being hungry. I am working away fine as can be, then suddenly, i am really hungry. I met with a raw food Guru today. She was amazing and i really enjoyed talking to her. I will post more on this tomorrow. I got hungry later in the day today. About noon, i got hungry. 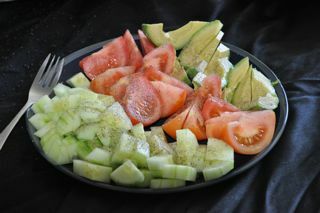 I ate tomato, avocado, cucumber plate. A couple hours later, i was craving an apple. I had one, and it tasted so good. I was not craving an apple anymore, but i was still a little hungry, so i had another apple. This apple was no wear near as satisfying as apple number 1. It did not even taste as good even tho it tasted the same. I had an orange a bit later and went off to meat with the raw uncook i met today. I got to try some awesome stuff at her kitchen including a cookie, eggplant bacon, and flax chips. 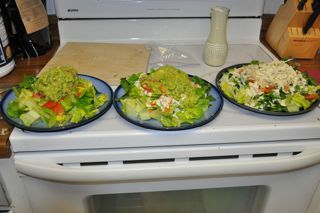 When we got home, i made dinner, salads with lemon tahini dressing. I did not care for the dressing and instead put avocado on mine. Lindsay and mom both liked it. Lindsay put avocado on hers as well and mom wanted her avocado on the side. It took me about an hour to prepare this simple meal of salads. Really, where does the time go? The good news is that I started earlier tonight and will be able to write a proper entry. I am still consuming a lot of oranges everyday. Adrienne posed the thought that perhaps the reason for oranges settling my stomach as much as they do could be because my stomach may not be producing enough acid on it’s own. I may, at some point when our trial completes, get this looked at by a doctor. Other than lots of oranges, I’ve maintained my habit or eating frequently in smaller portions, in other words, snacking . I have not been as good about getting my smoothies in everyday, which is something I need to do better with. My detox seems to be drawing to a completion, at least I think it is. My weight seems to have plateaued and I have decided to not weigh myself daily, but rather twice a week. However, my skin is looking much better. It is clearer and returning to the pink/pale it should be, rather than the slight yellow tinge it had before. My liver must be breathing a sigh of relief. My skin has been incredibly dry. This is due to the fact that my hands have been washed more frequently with the food preparation I have been doing. Another contributing factor is that I usually use lotion, but because none of mine are raw. I have chosen to not use them at this point because our skin is our biggest organ and will absorb that which it comes in contact with, but if my knuckles start to bleed this may have to be renegotiated. Adrienne did recommend raw coconut oil, but I’m hesitant. Today we went and spoke to one of Mum’s friends. A raw food chef and thoroughly lovely woman, named Patti. She was kind and generous with her time, knowledge, and supplies. She told us all about the variety of things that could be created raw. We tried raw chips, raw cookies, and really yummy raw facon (imitation bacon made out of eggplant.). She gave us some other stuff to bring home and try like raw vegan hamburgers, bread, cashew mayonnaise, fudge, and a number of other goodies. Later this month Adrienne will be taking a class from her all about raw food preparation. It was cool to see all the different stuff that could be made raw vegan. Please know that this next portion is somewhat graphic and meant for a mature audience…or at least one over 18. Also, guys are usually not interested in these kinds of things, in fact I hear they are mystified, horrified, and terrified by what I am about to discuss, but if you are interested, feel free to read on (but don’t say that I didn’t warn you.). Ladies, and brave gentlemen, along with my time of the month, I usually experience really nasty cramps. I’ve had trouble with them since I was in high school. Pain relievers are helpful, but it is still not a pleasant experience. When we decided to try raw food for 30 days I knew that I would have my cycle at least once; however, it didn’t dawn on me that I would not be able to use my usual remedies to help. When I did realize this I approached Adrienne and said that if we could find a raw vegan alternative I would be happy to use it, but if we didn’t I would have to take pain relievers because I am not in a position to be disable by cramps for a couple of days. Well, excellent news I didn’t get cramps when it started. I was beyond surprised. I didn’t say anything yesterday, because I didn’t want to speak to soon. I have had some pain, but when it shows up it only lasts a few minutes and is less intense than usual. My flow has been lighter too, which is nice. Ok…it’s safe now, well kind of…for you are still stuck with my sense of humour, as I give today’s joke (and it’s one for the ladies). Ask any man, and he will tell you than any woman’s ultimate fantasy is to have two men at once. While this has been verified by a recent sociological study it appears that most men do not realize that in this fantasy, one is cooking and the other is cleaning. This entry was posted on Wednesday, March 11th, 2009 at 3:11 am	and is filed under Raw Food. You can follow any responses to this entry through the RSS 2.0 feed. You can leave a response, or trackback from your own site.